Level 3 credit card processing refers to passing the line item detail from the invoice when submitting the sale transaction for settlement. Level 3 Data is additional information about a transaction which is commonly found on an invoice, such as product/service descriptions, quantities and other details. Visa® and MasterCard® apply higher Interchange rates for business, corporate, purchasing and GSA transactions if Level 3 Data is not included with the transaction. Interchange is the largest cost component of delivering merchant services and for merchants accepting commercial cards, eliminating non-qualified surcharges are especially important. Direct Interchange pass through pricing is the most transparent method and positions you to qualify for the lowest Level 3 rates available and Purchasing Large Ticket, GSA Purchasing and Visa B2B incentive rates for select industry categories. To submit the data needed to get the best rates, Level 3 payment processing technology must be used. 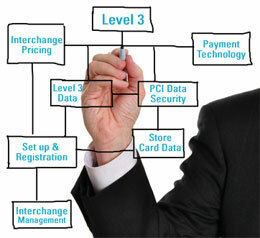 Standard credit card terminals and B2Consumer payment software are not capable of supporting Level 3. We recommend the benefits of Software as a Service that can be accessed through a secure web application. With evolving Level 3 requirements, virtual software is always the most updated version and multiple users can access the service on any computer with Internet access without the challenges of traditional software licensing, installation, networking, security and upgrade management issues. Providing Level 3 processing solutions means managing Interchange rates and qualification criteria for commercial MasterCard and Visa card payments. The reality is that most businesses accepting commercial cards from their buyers are NOT qualifying for the BEST available rates because their merchant account is not set up or registered properly. Contact Us for a free payment acceptance best practices consultation and savings analysis.